John Sullivan has been appointed Lancing United's new manager. 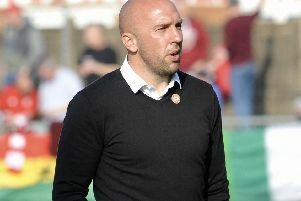 Lancing United Football Club have appointed John Sullivan as their new manager. Experienced Sullivan, whose watched three of United's matches this month, took charge following his side's 2-0 Southern Combination League Division 2 defeat at the hands of high-flying Rustington on Saturday. Despite being appointed United's new boss, Sullivan is unable to take up the position for three weeks, leaving assistants Dan Tuppen and Steve Allfrey to take the team until he returns. In what would prove to be Lancing United's final game without a manager, first half strikes from Stephen Kirkham and Chris Darwin saw Rustington past them. Kirkham headed Blues ahead after nine minutes, before Darwin doubled his side's lead on the half-hour. United applied more pressure after half time but Rustington stood firm to secure victory. LANCING UNITED: Allfrey; Johnson, George, Dixon, Singers, Page, Maymon, Measom, Munday, Lucas, O'Regan. Subs: Tuppen, Judd.